The message below was emailed to all campus residents on January 8, 2012. Welcome back to campus! As students filter back to campus from all over the country, I am reminded of the reason that we are here: You. 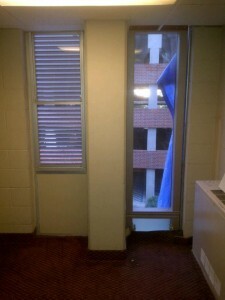 This is one of two test windows installed in Buddig Hall. Soon, every window in Buddig will look similar to this! others are in transit as I type this message. Loyola’s progress will be no more visible than what you will see when entering the Res Quad. 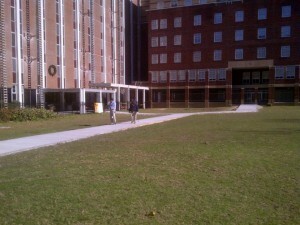 A new (temporary) sidewalk has been constructed and fencing placed around the South side of Buddig Hall in order to ensure student safety during the Spring semester. Also, large scaffolding has been established on the exterior of the South side of the building, which will hold crews as they begin work on the ‘skin’ of the building at the twelfth floor and work their way down. Throughout this process, your safety and security are our primary concerns. Window louvers will be adjusted as crews progress to maintain privacy for residents inside the building. The Office of Residential Life is working closely with Loyola’s construction managers to minimize noise throughout this process. Crews will be working daily throughout the Spring semester and have agreed not to begin daily work until after 8:00 AM. 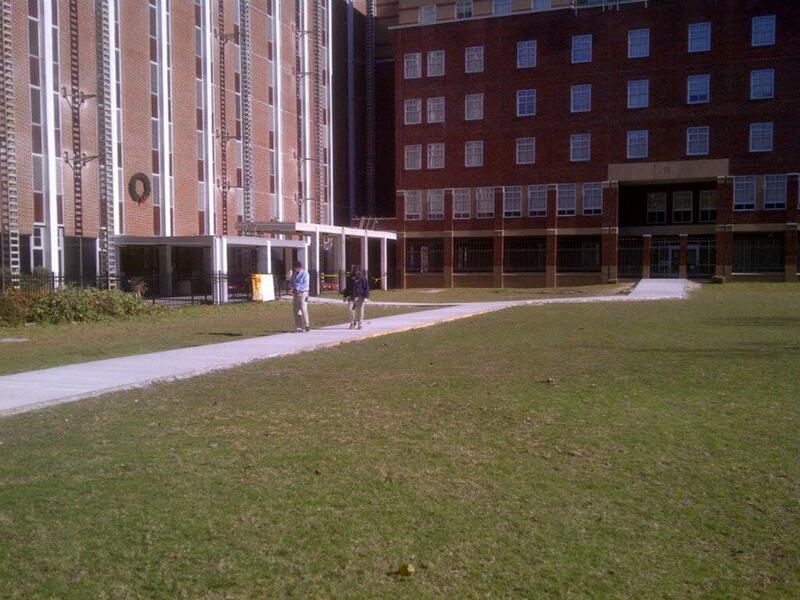 This temporary sidewalk has been installed in the Res Quad to ensure a safe walkway for students and visitors. through social media outlets and via the Livin’ Loyno blog. We’ve posted photos of the progress on both our Facebook Page and blog. Also, RHA meets regularly and is a powerful voice for students living on campus. I’ve included links below and invite you to connect and learn more. May the new year bring all the peace, prosperity, and progress that you deserve! « The future of Buddig Hall is here!